Change is afoot on the North Fork. As more out-of-towners discover the serenity that envelops the countryside region, more boutique hotels have sprung up to fill the demand. What hasn’t changed however, is the area’s distinct, almost defiant appreciation for the locale—even Starbucks couldn’t survive in Greenport once it opened across from the locals’ favorite coffee roaster. Above all, North Forkers champion the community, which means the only chain you’ll see is the daisy chain of handwritten signs along country roads advertising farm-fresh eggs. Many of those sign-makers also open their doors to guests, and there’s a growing consensus to make the homestyle experience even more high-end, an approach highlighted by six unique properties that seamlessly combine charm and luxury. Jedediah Hawkins Inn seems ripped from the pages of a fairytale. The storybook charm only continues after arrival. Just off the chockablock main road that runs through Jamesport, Jedediah Hawkins Inn stands in a field of its own. 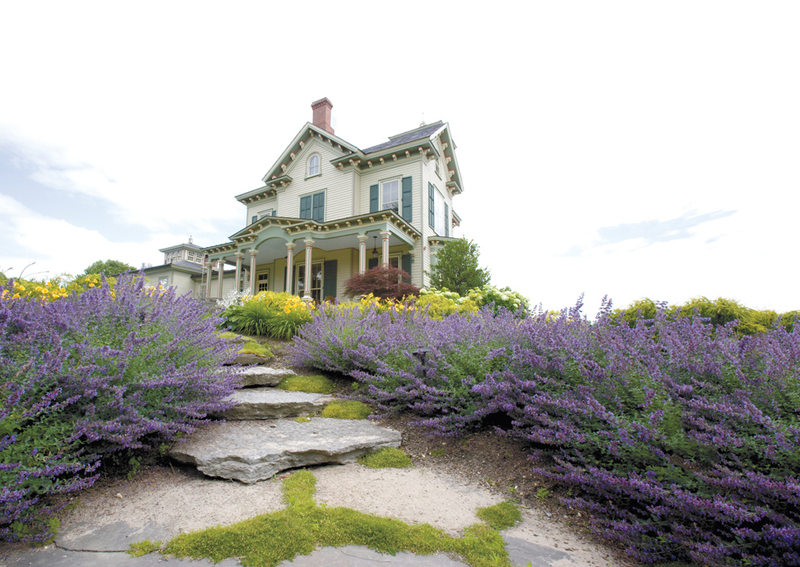 The historic Italianate-style house rises from 22 vibrantly landscaped acres as if from the pages of a pop-up book. It’s a wonder that this former sea captain’s house—with its square cupola, twin chimneys and cross gable roof—was set for demolition before investors swept in, reclaiming the derelict architecture. The ensuing restoration was quite sensational, much to the fantasy of fairytale weddings and old-soul travelers with an appreciation for a touch of ceremony. To that end, the character of the estate is well intact without a trace of stuffiness: floorboards creak comfortably along the ground-floor’s bar, fireplaces charm sun-drenched guest rooms, paintings by local Jamesport artist Max Moran feel evocative and hang at ease. The inn’s restaurant pulls fresh herbs and eggs from their garden and coop and seafood from the surrounding waters. Dipping below the surface, the speakeasy in the flagstone-walled basement is a storied wine cellar rumored to once be part of the Underground Railroad or that the late captain was a gunrunner. Jedediah Hawkins opened as a designer show house, each of its six rooms embracing different styles. The most exciting is the Belvedere Suite. Accessed by a private twisting staircase, the suite commands the entire third floor and makes the most out of the lofty space. Sloped ceilings and handsome reading nooks are cozily furnished, but it’s the additional flight which steals the show: As the top-floor booking, it’s the only room with access to the perched cupola for a 360-degree view of the bucolic surrounds and neighboring vineyard. Jedediah Hawkins’ outlook, more than a decade after opening, is as fine as ever. American Beech’s lobby doubles as a retail shop of looks by co-owner and fashion designer Alex Vinash. Even on not-so-sunny days, upbeat music bops along in the courtyard of American Beech—because why not? The breezy vibe is palpable even from the street, which is the point to an 11-key hotel without walls. Relax: these aren’t open-air accommodations. 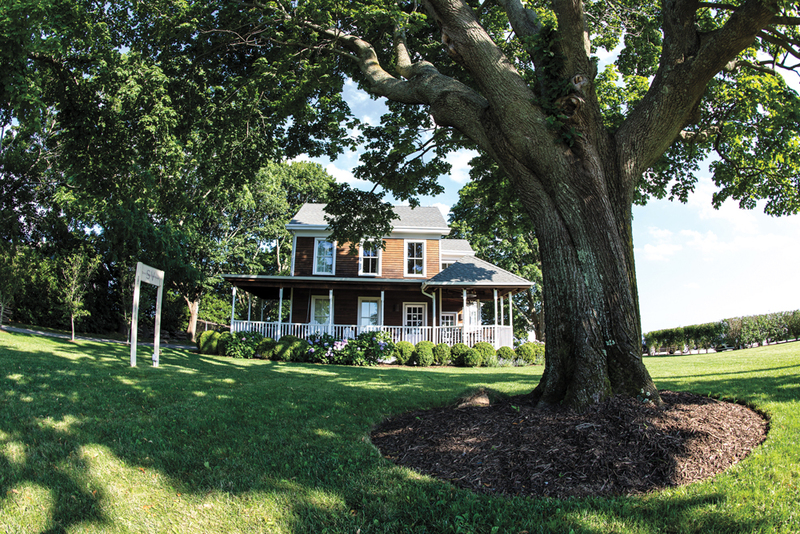 In 2014, owners Alex Vinash and Brent Pelton purchased Greenport’s Stirling Square, a clutch of two-story buildings, and converted one of them, a 19th-century horse stable, into a small-scale resort without the stuffy corridors. 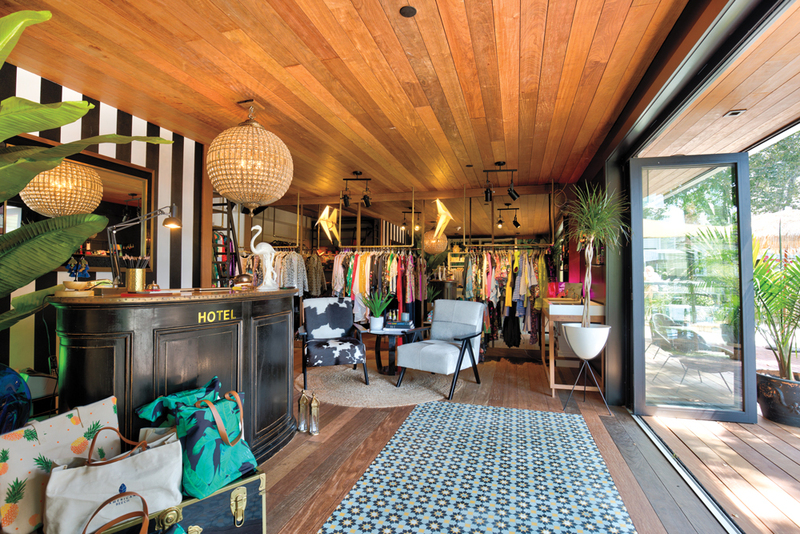 The vibe begins at check-in, which fashion designer Vinash turned into a 500-square-foot boutique overflowing with tropical swagger and items from his collection—the front desk doubles as the shop’s clerk. Grey-and-white striped canvas covers the courtyard’s outdoor bar and match the painted floors in the hotel’s restaurant, where beech-blonde wood and white-paneled banquettes are all anchored with well-groomed nautical touches, like artwork made from sailing rope and hints of brassy sailing cleats. Large, leafy statement plants billow from corners like jungles bursting from the restaurant’s seams. American Beech has grown to 11 rooms from its original five, located on the upper floors of the boutique. Each is different and all are modern, loaded with a collection of plush, contemporary furnishing. Bedding rustles with crisp Frette linens—robes and towels, too—white walls pop with bold-colored art and the mini-bar is stocked with cocktail swag including bottles of Casamigos tequila, Bloody Mary mix, and half and full bottles of Macari wines. Beneath the rooms, you’ll find some of Greenport Village’s best venues all in one place—the Square is home to 1943 Pizza and Brix & Rye cocktail lounge. When Shinn Estate Vineyards planted vines in Mattituck in 1998, it raised an eyebrow as biodynamic wine wasn’t quite the household concept it is today. But after the estate’s first vintage release in 2002, it was clear the owners had tapped into a new wave of ethos—their sustainable approach was quickly a darling of the industry. When the vineyard was sold last year, new owners Barbara and Randy Frankel kept the culture intact, keeping the same vineyard crew, wines and Patrick Caserta, the vineyard’s winemaker since 2011. But the interiors, from the tasting room to the 19th-century farmhouse inn, certainly had a spruce. Local designer John Mazur lifted the traditional farmhouse interiors with hints of texture and rich undertones. At breakfast, a muted palette of dark-wood floors, white-shiplap wainscoting and soft-grey walls warm up with frittatas, homemade scones and waffles at the rustic trestle table, surrounded by studded wingback chairs. In the early evening guests nibble cheese and sip wine in the living room, plush with faux-fur throw pillows, framed prints of the North Fork and a cast-iron wood stove. Each of four rooms are simple and serene, though the most coveted is Vineyard West. Its cathedral ceiling and spacious layout feels more like a private guesthouse. There’s enough room for a pair of tufted lounge chairs and two tall windows overlooking the vineyards. The reason to stay is for the wine, and for that matter, Shinn’s tasting room just rounded out a complete renovation. The upper loft was removed to reveal higher ceilings with wood beams—all the more reason for guests to linger after their complimentary tasting. Outside, the wind turbine spins as it always has, powering the vineyard while guests soak-in the lush new look. That Riverhead lies where Long Island splits into northern and southern peninsulas—an actual fork in the road—meant the town was a pit stop for travelers. But now it finally has a showstopper and a reason to stay a little longer. Opened earlier this year, The Preston House & Hotel feels as if it’s been plucked from Chelsea. 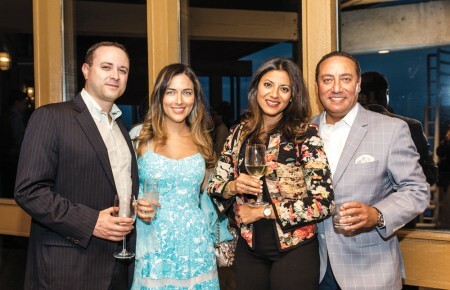 At the forefront, the historic 1905 home of Henry H. Preston, the county’s first salaried sheriff, has been restored and reimagined as a sophisticated restaurant, while rising behind it through four glossy stories are the hotel’s 20 guest rooms. Automatic doors slide open to reveal polished, concrete floors and slate-painted walls, setting the stage for an altogether slick aesthetic. The building certainly looks as if it could fit more guest rooms than 20, but owners stressed quality over quantity, and it doesn’t appear any budget was spared. It shows inside each room, where built-in and clean-lined cabinetry, headboards and side tables are luxuriously clad in white oak. Digital panels take the place of the standard “do not disturb signs,” meaning a single button will guarantee privacy. Frosted glass separates king rooms from their high-gloss bathrooms, which are finished with Carrara marble and stocked with William Roam toiletries and plush Frette slippers. The hotel’s high-design upends the historic house at the helm, making for an extraordinary contrast—countrified elegance at one entrance, citified lifestyle through the other. For that matter, the restaurant is a stunning fixture for Riverhead, as designers managed to make history feel brand new and relevant, creating an elevated place to dine and rest. At least within these walls, the town is no longer a drive-by. 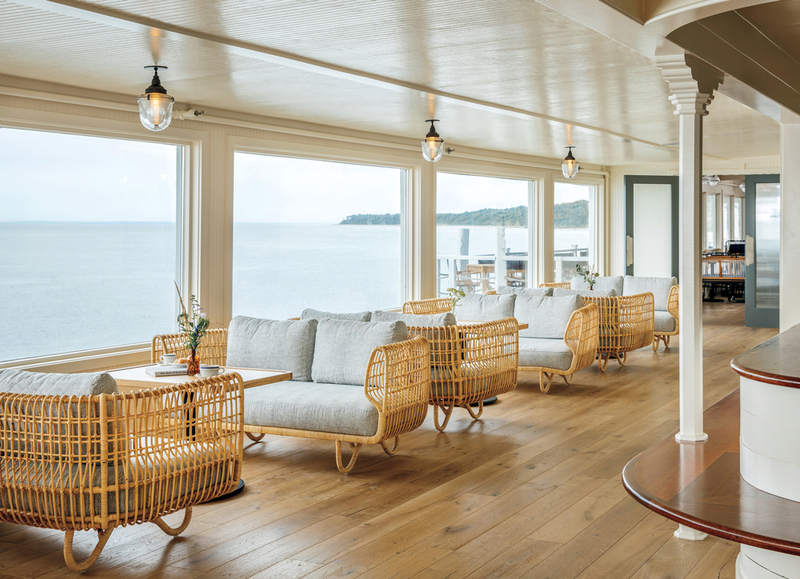 Guests of the Sound View need not wait long to discover the hotel’s namesake—the lobby offers stunning sights of the Long Island Sound. Five minutes from downtown historic Greenport—or an equally swift bike ride—sits the Sound View, a reimagined mid-century motel along route 48. Its long, low-slung architecture belies what lays on the other side: a quarter-mile stretch of private, pebbled beach. Make no mistake, there is no better view of the Long Island Sound than along this curved coast—it’s the hotel’s namesake, after all. 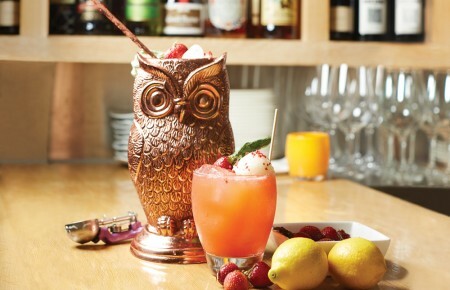 The 55-room hotel, which officially reopened last year, was brilliantly restyled by Brooklyn-based Studio Tack and fine-tuned by its new owners, Eagle Point Hotel Partners. Now the sunset has a refreshed canvas to drench with purples and pinks. And guests have a sensational front-row seat: shared and private decks are lined with stylish patio furniture custom-made with maroon sail cloth and white rope. Guest rooms are outfitted in what Studio Tack calls the coastal version of New England’s Bauhaus homes: an organic undertone with speckled cork-and-rubber floors, light cedar shiplap walls and framed artworks of tranquil color fields. At breakfast inside the airy lobby, the designers’ nod to the golden era of motels is on display. Warm baked goods and fruit salads of cantaloupe and honeydew are just part of the spread in the breezy room of light-rattan loveseats with powder-blue cushions. 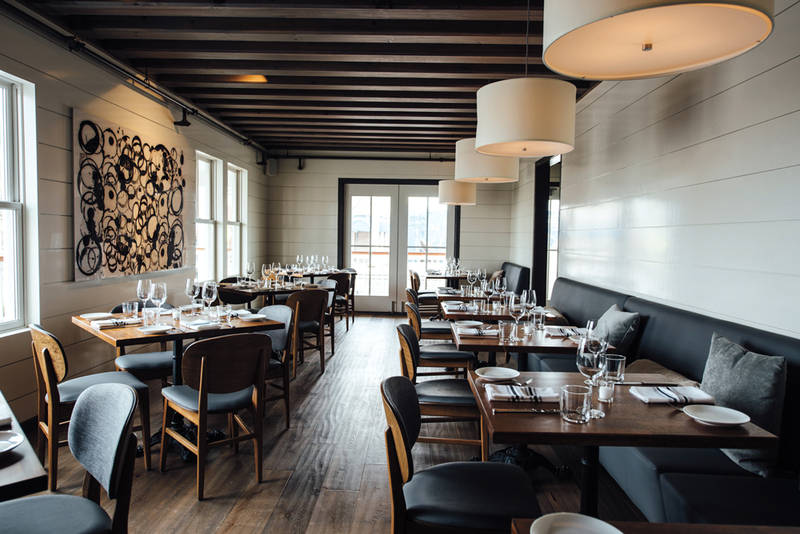 In the evening, the adjacent Halyard restaurant may have James Beard award-winning chef Galen Zamarra curating the menu, but keeping with the property’s original no-fuss vibe, the fare is cozy and familiar. By night, an adjacent piano bar matches the mood: an exercise of restraint. Besides a touch-up here and there, owners left its 1970s look (glossy red banquets, dark wood paneling), conditioned only with contemporary spirits and a new roster of talent for the piano. North Fork bed-and-breakfasts have a tendency to change hands. Among the recent highlights is The Morning Glory Bed & Breakfast, whose new owners have, as they’re putting it, simply de-B&B’d the experience. It’s the same house with a new name—The Inn at Bridge and Main—and owners with a different pedigree: Eric Elkin, the wine club manager at Southold’s Sparkling Pointe Vineyards & Winery, and his wife Bridget, a real estate broker with Daniel Gale Sotheby’s International Realty, who brings a savvy business sense (a stint at Ralph Lauren is in her portfolio). The classic look mostly remains (clawfoot tubs, hardwood floors, fireplaces, French linens) but with a modern edit. 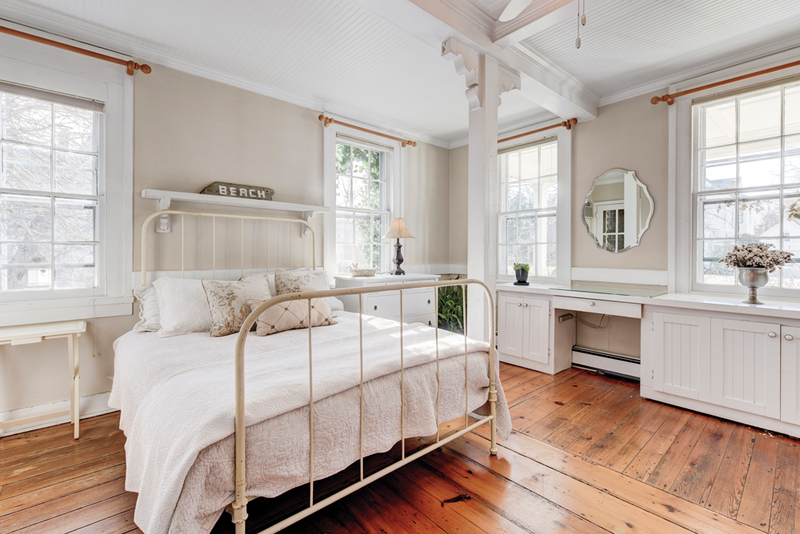 Within three guest rooms, the former look is out, trading shabby-chic (no doilies allowed) for authentic vintage furniture recalling the North Fork’s overlooked antiquing scene, along with splashes of color (primarily aerial photography of the North Fork shot by Bridget). Expect a pared-down look—modern farmhouse vibes—but don’t expect a traditional B&B breakfast. Instead, Eric dishes lobster and avocado toast or farro bowls with poached eggs. Nearly all ingredients are sourced within 10 miles of the house, particularly the coffee, which comes via Aldo’s Coffee just a few blocks away. In the evening, Eric might set out all of the ingredients that spell a Manhattan. Anything from the kitchen is also up for grabs, whether it’s a Greenport Harbor Brewing Company micro-brew, wine from Macari Vineyards or bubbly from Sparkling Pointe, of course. The biggest change afoot is that everything is included in your stay. Call it an all-inclusive if you must, although with only three rooms, it’s certainly exclusive.